leading then-President Zine El Abidine Ben Ali to step down on January 14, 2011, after 23 years in power. commentators as "heroic martyrs of a new Middle Eastern revolution." Leviticus 7:31: "And the priest shall burn the fat upon the altar: but the breast shall be Aaron's and his sons'." Muhammad Bouazizi's self-immolation was the flashing point of the Tunisian revolution and therefore of all the other ones. YHVH in Hebrew) from Heaven." Psalms 104:29: "Thou hidest Thy face, they are troubled: Thou takest away their breath, they die, and return to their dust. 30 Thou sendest forth Thy spirit, they are created: and thou renewest the face of the earth." Which is interesting since 1 Corinthians 15 is about the resurrection of the dead (see verses 35 and 42). 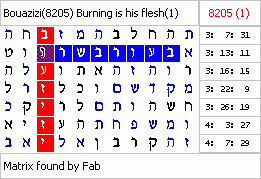 The word "spirit" in the axis term shares a letter with a literal mention of wind/spirit" in Job 8:2.